Combine the chocolate and butter in a medium heatproof bowl set in a wide skillet of barely simmering water, and stir frequently until completely melted and smooth. Or microwave on Medium (50%) power for about 2 minutes, then stir until completely melted and smooth. Remove from the heat. Stir in the liquor and semolina flour, if using. In a large bowl, beat the eggs, sugar, and salt with an electric mixer at high speed until light and fluffy and the consistency of softly whipped cream. Use a large rubber spatula to fold one third of the eggs into the chocolate mixture, then scrape the chocolate butter over the remaining eggs and fold until blended. Divide the batter among the ramekins or bowls. To bake the budini: Place them on a cookie sheet. Bake until puffed, crusted, and deeply cracked but still gooey inside when tested with a toothpick, about 20 minutes, or 25 minutes if they have been refrigerated. Serve hot or let cool, but they will puff up again when reheated in a 375˚F/190˚C oven for about 10 minutes. That looks so decadent and chocolaty and good! 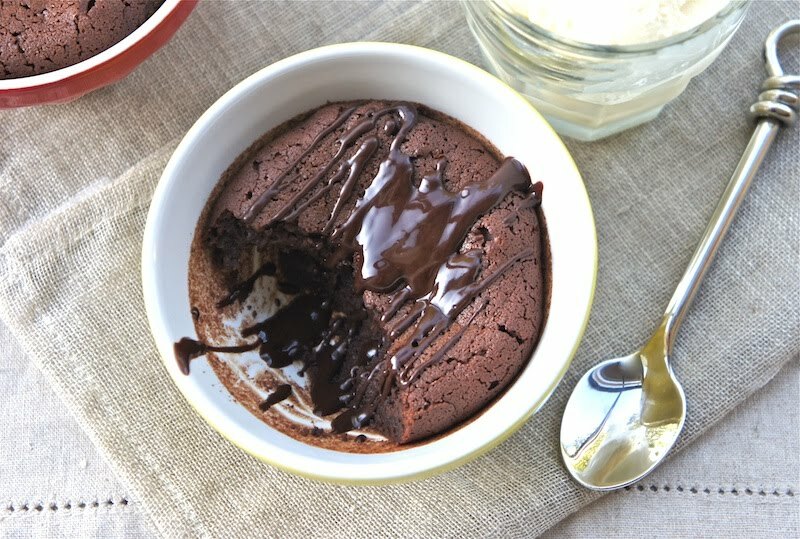 Looks yummy, and similar to a recipe I do for chocolate pudding cakes with sweet tomatillo sauce that originates from Rosa Mexicana restaurant in NYC. You might like the sauce instead of the chocolate drizzle! Ohhh this look so good! Ohhh that looks delish. My husband would love it. @Cooking With Michele: Interesting recipe, I bet it tasted really good. @Joy: Thanks and hope your husband like it.